I'm not accomplishing much in my sewing room because the sun has finally come out! It's been so cold and miserable here that one wants to be outside all the time when the sun finally appears. 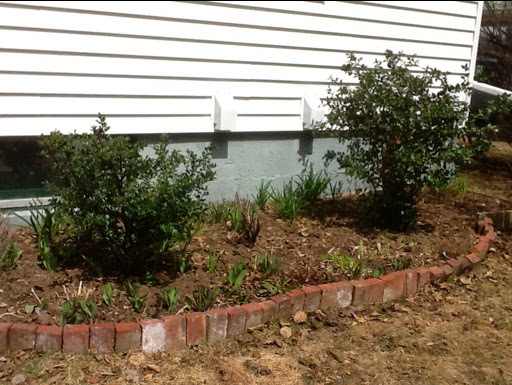 I've been working my way through all my gardens, edging, weeding and mulching. It's a humble abode but it's ours and it pleases me to get outside in the gardens and tidy up. There's not a lot in bloom yet; even the trees are just leafing out. My step pot is still empty as we will likely have another frost. Before going outside, I experimented a bit with the cosmos piece. I added a small piece of cotton that I picked up yesterday yarn as a stem and I stitched on a piece of organza over top of a small flower. I like the stem and will probably do the rest but I think I'll be picking off the organza. It strikes me as too strong a color. Tomorrow I'm going on a day trip with friends to Moncton. We'll be aiming to hit the quilt shop, a yarn shop, Home Sense, Costco, Chapter's and a few others. Sometimes I actually have to rest up in the car! I'm really hoping I can find something suitable for birders on the little piece above. This morning I got my housework done for the week, so now I can forget about it and move on to some fun things! 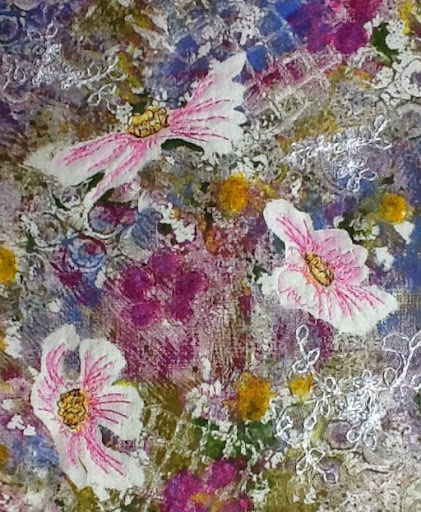 First up this afternoon, I added a few wispy stems to the flowers. 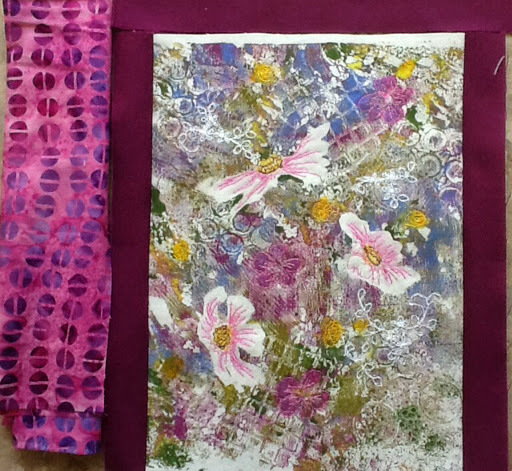 Now I'm auditioning possible fabrics for the borders. 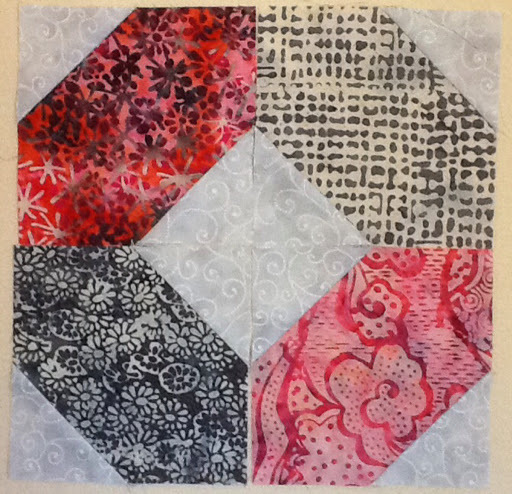 I think I've decided to use the crazy patch blocks on the corners along with a batik in between. The color I want is the top one shown above but I do not have enough. 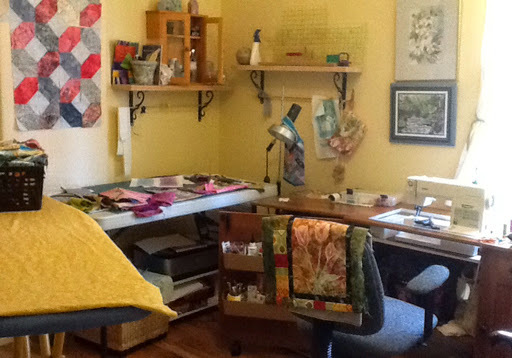 I'm hoping I'll find something Friday when I go out of town to visit a quilt shop. It is just the right shade of pink. Since I can't go any further on that piece, I sandwiched my tulip runner and started the free motion quilting by quickly thread sketching in black outlines. I like the definition that the black thread gives it. I'd like to tell you about a second blog that I have just started. I've been thinking about it for a while, especially since December when I developed neuropathic pain that was intense and just wouldn't quit. I want to write my experience with chronic illness and pain, in hopes of networking with others. I want it to be a place of mutual experience and hope. I know there must be others going through similar things. Sharing takes the weight off. Perhaps we might learn something too. This weekend, I did a little more free motion stitching and started adding a narrow border. 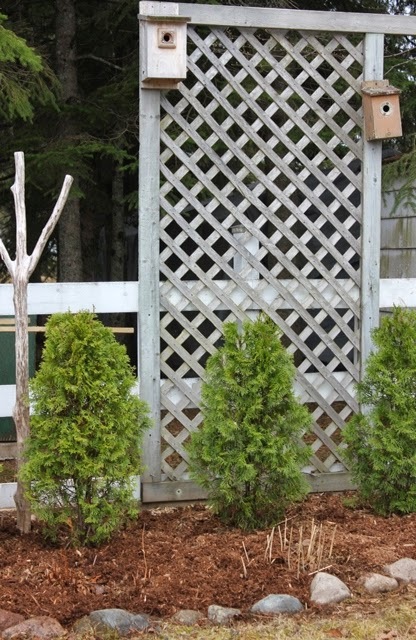 The plum accent border will finish at 3/4". 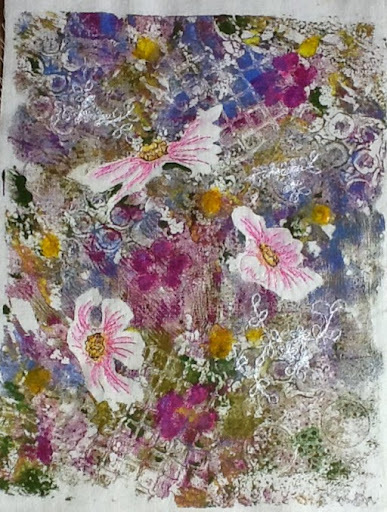 You might be able to see where I stitched small plum colored flowers and added yellow centres to some daisy like flowers. Now, I'm at the point where I'm playing with ideas as to how to finish it. Should it have a plain batik border or should I piece a border? 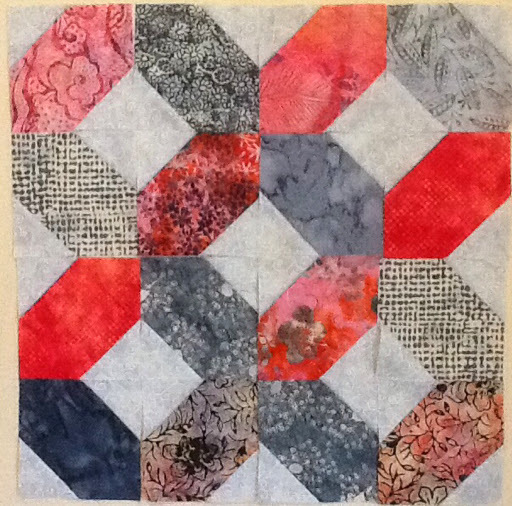 I'm playing with a pieced border with a couple crazy patches thrown in. Sometimes, I like to add bits of my screened fabric here and there. 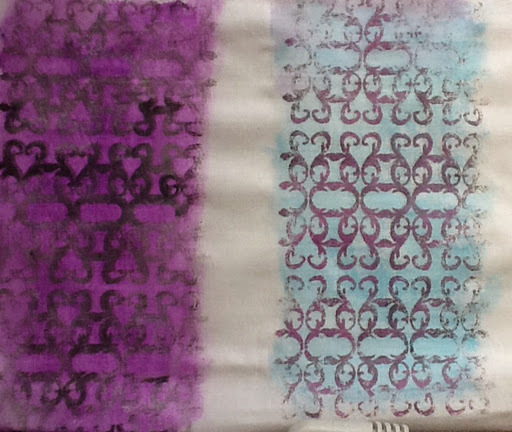 The pieces below were screened with fabric paint and colored over with Neocolor II crayons. The purple side is wet and will probably fade a bit as it dries. Should it maybe have a plain batik border instead of a pieced one? This is what makes the process fun for me. I get ideas, I drag out my scraps, I play, and then I come to the slow more thoughtful part. Making up my mind. It's never wasted time though, because I have fun in the process, and if I decide not to use the stripped pieces or blocks, they become the starting points for other projects such as bags or mug rugs. This is about as messy as I get. There are 3 projects on the go here. This morning, I headed outside to pot up a few plants. We've had so little sun that it must be enjoyed when it comes. Yesterday, I went for a long walk and decided en route that I would start another blog where I would write more about my journey with chronic illness and chronic pain. I want to hear from others in the same boat and hear about how they cope. Yes, it might be kind of crazy to start another blog when it's sometimes hard to keep up with one, but I've wanted a place to write more about my illness, not to complain, just to express how I feel and perhaps network with others. 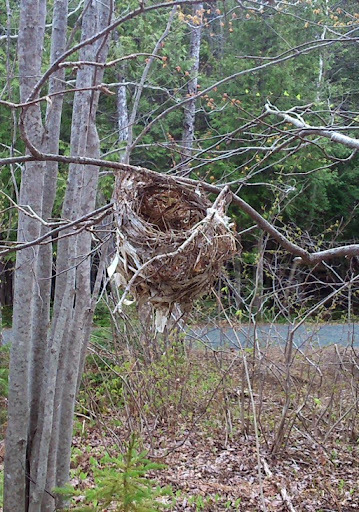 This is a beautiful little nest that I pass by every time I walk the trail. It has remained unused for several years. It may come home with me one day. Now, I'm going to rest as I'm going to the golf course with Gord for my first round of the year. We'll see how many holes I can do. Today, I've been out most of the day meeting friends for coffee and lunch. 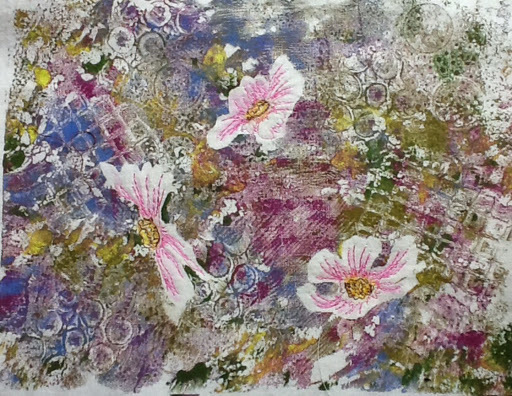 I squeezed in some time to add some bits of lace and some paint in a few areas of my Gelli print piece. Now I must be patient and let it dry before I can stitch some more. 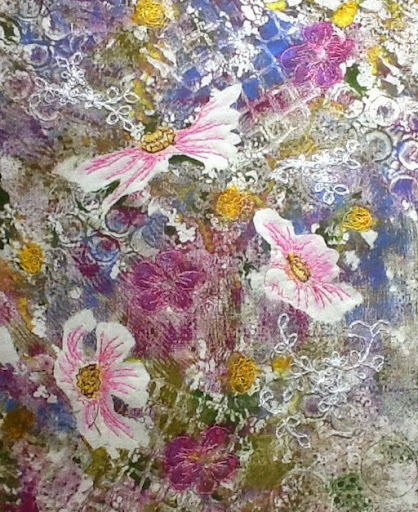 I like the way the layers are developing and the whispy bits of lace make me happy! We are celebrating our 34th anniversary today. 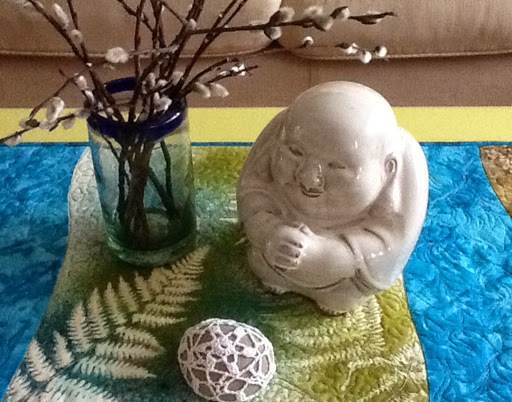 My husband gifted me with this little chubby Bhudda after a prompt from me. I had discovered it at a shop but was told by my friends that it's not lucky to buy it for yourself. Lucky for me, this was just the occasion. Yes, I've started a baby quilt and have a couple of other art pieces in in various states of progress but the artistic muse hit me and since it's been away for a while, I decided to go with it. Maybe it had something to do with the hour walk I took with my friend Anne to Peter's River and back. 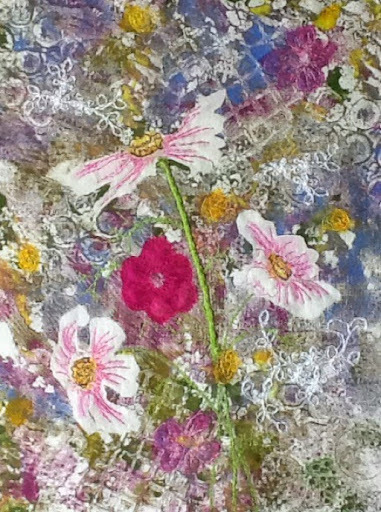 I only did a bit of thread painting-- a touch of pink on the cosmos and some gold and brown in the centres. More will be added later once it's bordered and sandwiched for the quilting process. It made me oh so happy! I've got plans! 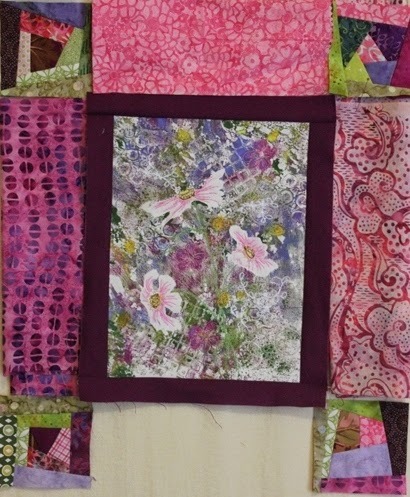 I want to add some feathery stems and more small flowers with lots of quilting and small details. Perhaps it will have some hand stitching and a pieced border. Have patience! It's a long weekend here in Canada which meant I had my husband to walk with again today. Despite dreary misty weather, we went and walked around the golf course. We got a bit wet, though thoroughly enjoying the peacefulness. Normally, it would be open by now but because of our long winter, it has been delayed. Earlier today, I put the borders and ends onto my runner so it's already for sandwiching and quilting, something I look forward to. I shall have to look for batting and backing later today. I picked away at the batik blocks for the baby quilt here and there, arranging them in no particular order. The colors make me happy. The photo shows more orangey than they are in real life. They're actually more pink with orange accents. Must be the I Pad camera. I'm still learning to cope a day at a time with neuropathy. I've even been pondering a new blog that might address some of the issues but perhaps it would just be depressing. For now, I'm going to stick with a lightened output here and a slower pace. I would be happy to hear from anyone else coping with any type of neuropathy. There's definitely a plethora of information on the net although sometimes it's nice to network with like minded people. Happy Victoria Day to Canadian readers! I'm still here picking away at a few little projects, and enjoying my garden, finally. I've been sitting on my deck and cleaning and mulching my few beds perennial beds. Sometimes, I feel like having something mindless to work on and this is one of those times. 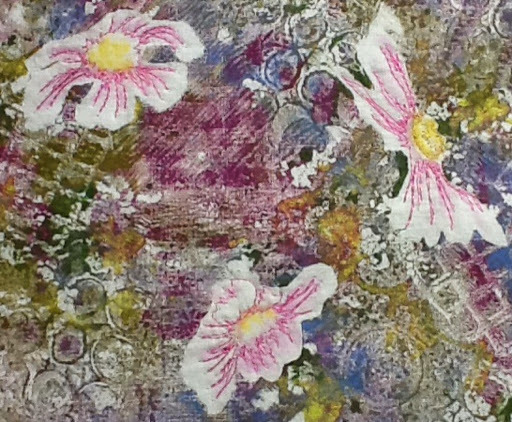 I picked up a little fat quarter collection of soft grey and pink batiks. I'm using a pattern that I came across U tube called X's and O's to make a baby quilt. It actually calls for a charm pack. The squares are 5" and the smaller ones stitched onto the opposing corners are 2 1/2". Super easy, which is what I like! You can find the tutorial and lots of pictures easily but if you're stuck let me know and I'll send it to you. Since my children don't live nearby and it's just my husband and I -- we visited his parents yesterday--I vowed to do just the things I love today. We went for breakfast at one of my favorite spots, The Nectar and afterwards, despite the damp cold temps--it was 6C when we arrived home-- we donned our yard clothes and went outside. Gord vacuumed the car in preparation for our trip to Moncton tomorrow and I hoed some of my back garden and laid a bag of mulch. This garden runs along the hedge at the back fence. Everything to the left of the picture is still surrounded by snow and too frozen to work! We even cleaned out the birdhouse hoping for another family of chickadees this year. I discovered this little patch of lichen growing near the fence. I love the bright reds and the little cup like shapes on the right. Sometime I will get myself a reference book and look them up. I find them totally fascinating! After a little snack, I wanted to come into my sewing room long enough to get the scrappy strips onto the tulips and I did. I also cut green batik strips to add next time to the sides. I think it will make a happy runner. I'm having a cup of tea, going to try calling my own mother, and then maybe have a soak or watch a movie. We purchased a couple of lobsters yesterday for our dinner. Despite my on going health puzzles, I'm trying to enjoy the day. One samll hitch is that I discovered a message this morning that my doctor's appointment that I was really counting on for tomorrow has been postponed for 3 weeks. More waiting. We're going anyway as we both need the little getaway. I'm wishing all you mothers out there a happy day. I've been walking, doing yoga, reading, having soaks, still basically looking for any relief for my particular kind of annoying pain which may be some type of neuropathy. Medications so far have not been effective. It's been a week so I thought I'd pop in to say I'm still here and still doing some sewing when I feel inspired. This morning I walked to the hairdresser for a haircut and took the long way home. 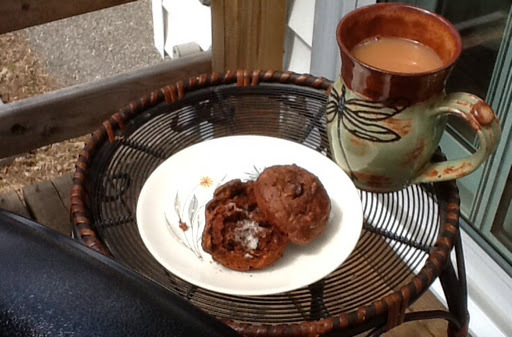 After lunch I made these most delicious banana bran muffins with cocoa and chocolate chips. They've got to be healthy with the bananas and the bran, right? I could be renamed the muffin lady I post so often about my various muffin recipes! What I do is wrap each one in cellophane to freeze and then when my husband packs his lunch he can choose from the bag in the freezer. I just found the recipe in the latest Chatelaine magazine that arrived in my mail yesterday. I'm enjoying one with a cup of tea on my deck as I write this. Delicious! 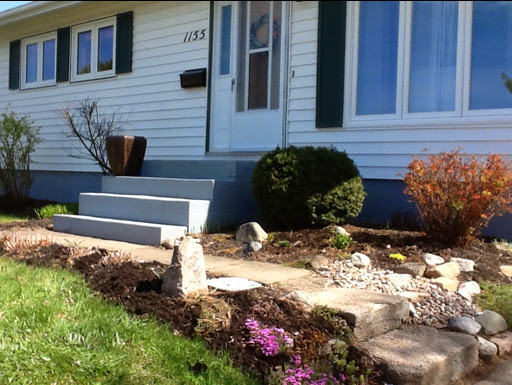 Yesterday I cleaned up my small gardens against the back of my house. It was so good to finally get outside. The allium and tulips are up. I fill in later with a few annuals and even some veggies, making good use of a sunny spot. To show you why I'm so happy to get out into these small gardens, here's a different view. 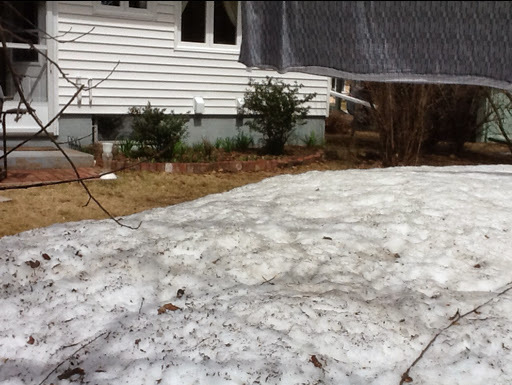 Half the yard still has snow. My compost bins are still buried and frozen. Summer comes slowly here and even more so this year. I haven't done anymore on my tree but I am going to cut out a moon shape and try it out in a spot behind some branches. Just thinking is progress for me these days! 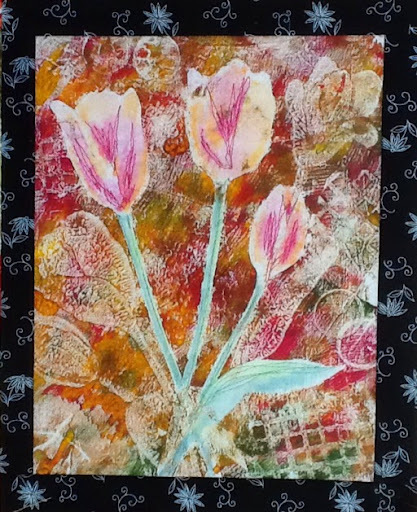 I did pull out two Gelli printed tulip pieces while I was cleaning and couldn't resist doing something with them. 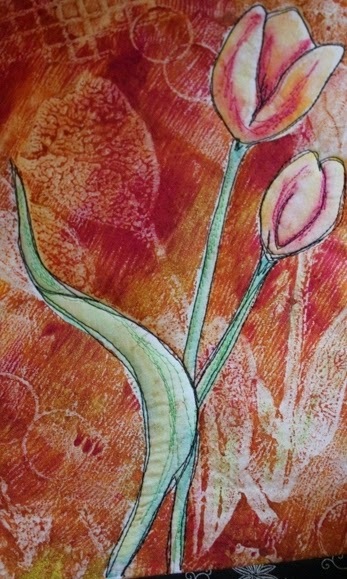 So far I've painted the lighter tulip shapes with my Neocolor II crayons and then added a bit of free motion stitching. I bordered each one with a black and white print. 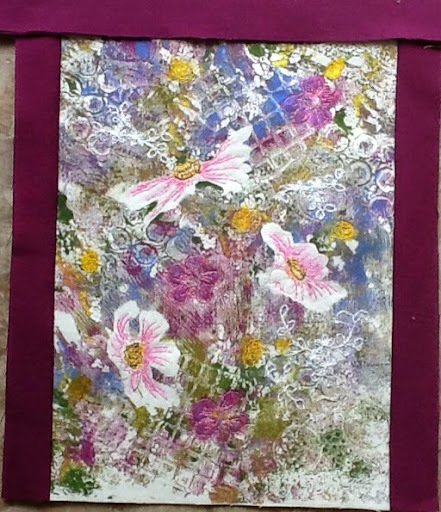 Originally I thought of wall hangings but I'm trying them out as another table runner. 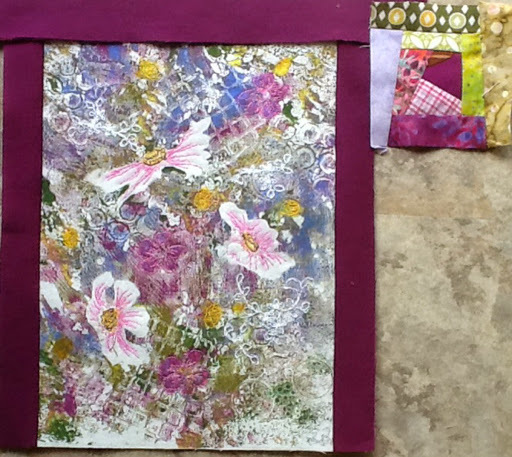 The plan is to add pieced borders, then another plain border. 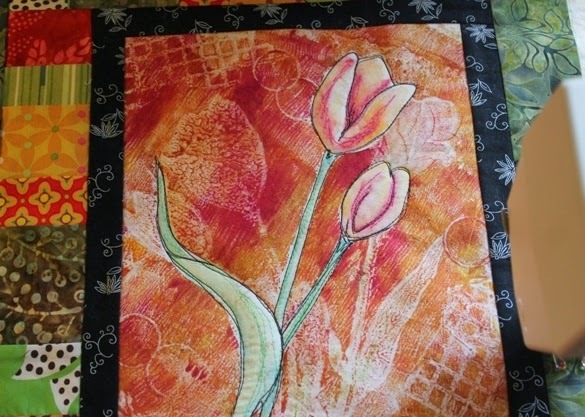 I want to sketch/ thread paint the tulips with black thread once it's sandwiched. What do you think? Runner or wall hangings? I like having the combination of art and usefulness on my coffee table. I'm writing this on my deck and took the pictures with my I Pad so I know they're not the best. I'm happy to at least be writing a little something. Ooh, the sun just came out from behind a cloud. It feels so good! I'm a shade seeker all summer long but right now the warmth feels divine.